Game description: Dr. Muto is a fully 3D, free-roaming, third-person action adventure game set in a stylized universe full of fiendish puzzles, mind-bending devices, freakish monstrosities, and twisted comedy. You are Dr. Muto, a maniacal and genius mad scientist whose latest experiment has accidentally destroyed his own home planet--all except for his laboratory. 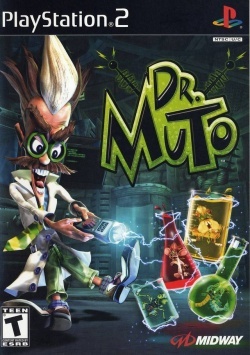 The game features a cast of unusual characters including Dr. Muto's sidekick, Janky, and his nemesis, Professor Burnital. By simply sampling some DNA, the doctor can morph into a spider, mouse, gorilla, or whatever creature he sees fit to become. Now he must use his fiendish gadgets and morphing ability to steal organic matter from the neighboring planets in order to rebuild his world. The game follows Dr. Muto, a maniacal and genius mad scientist whose latest experiment has accidentally destroyed his own home planet. In order to rebuild his world, he steals organic matter from neighboring planets. Dr. Muto uses his invention, the Splizz Gun, to mutate and morph into other organisms to complete his tasks. This page was last edited on 25 December 2016, at 17:26.